Hoare Bros Transports Leopard Tank to Canberra | Hoare Bros.
A retired army tank has been given a new home at the burnt out Canberra Services Club in Manuka. 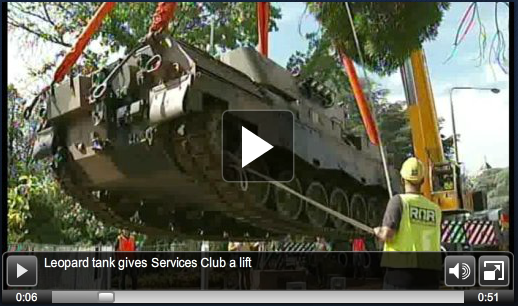 A 35 year old retired Leopard Tank was transported by Hoare Bros to the Manuka Service Club as part of a government initiative to pay tribute to service persons. A tricky job involving heavy coordination with traffic controls and logistics to have the tank into position safely. The tank was transported from the Bandiana Army Base Wodonga to Manuka in the ACT.